Pakistani PM Nawaz Sharif has met President Barack Obama in the White House to seek an end to drone strikes and the formation of a new post-Afghanistan war relationship. But correspondents say that few breakthroughs were expected on contentious issues on their agenda. The US was unlikely to offer any assurances on its secretive and controversial drone programme. 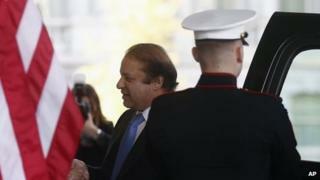 Relations between Islamabad and Washington nosedived two years ago. In May 2011 al-Qaeda leader Osama Bin Laden was killed by US special forces at his hideout in Abbottabad in north-eastern Pakistan without the Pakistani government receiving prior warning from Washington. Relations were further strained by the killing of 24 Pakistani troops in a US air strike along the Afghan border later in 2011. "We want to find ways for our countries to co-operate, even as we have differences on some issues, and we want to make sure that the trajectory of this relationship is a positive one,'' White House spokesman Jay Carney said. Mr Sharif said on Tuesday that drone strikes had "deeply disturbed and agitated" the Pakistani people and that his government was committed to bringing them to an end. "The use of drones is not only a violation of our territorial integrity but they are also detrimental to our efforts to eliminate terrorism from our country," he said. The prime minister said that the issue had become "a major irritant" in relations with the US. BBC Pakistan correspondent Shahzeb Jillani says that Mr Sharif is seen as adopting a populist stance largely meant for domestic consumption. Washington is unlikely to agree to any curtailment on its secretive and controversial drones programme, our correspondent says. Instead, President Obama will be more interested to hear from Mr Sharif the role Pakistan could play to ease his troubles in Afghanistan as the US prepares to pull out troops next year. Mr Sharif was expected to assure President Obama that his government is keen to ease regional tensions and live in peace with its neighbours, Afghanistan and India. He was also expected to look for Washington's help in reviving Pakistan's struggling economy and its growing energy crisis. In the end the two sides met with their own wish-lists, our correspondent says, but having experienced a low point two years ago, the meeting was likely about having realistic expectations from a complicated relationship. Can al-Qaeda survive the drone strikes?